The last reservation of this item will conclude on June 5. For rentals that require shipping or a pickup at a non-headquarter location, please select a later date for your arrival. Headquarter offices are the only locations that can accept a same-day reservation, as transit time is not calculated in this date. The Manfrotto 546 Tripod Legs with 504HDV Head is relatively compact for a full video tripod system and sports rubber feet for good grip on a variety of surfaces. The 75mm half ball head allows fast leveling and a sturdy tilt platform. This tripod and head system is ideal for any video application. 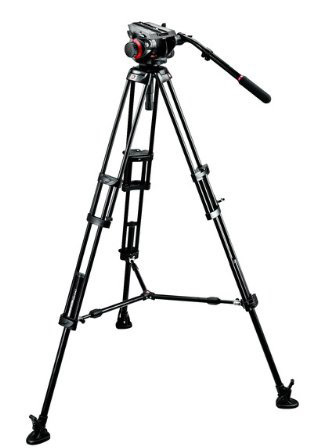 The Manfrotto 546 Tripod Legs with 504HDV Head has a 75mm Bowl Based Tripod Head, and Legs.